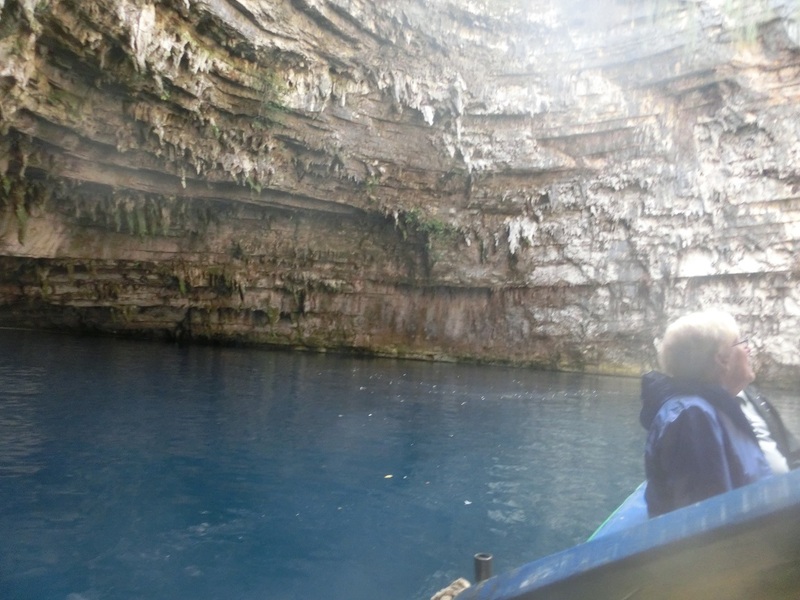 Behold the natural attractions of Cephalonia,　including those beneath the surface, such as the Drogarati Cave and subterranean Melissani Lake. 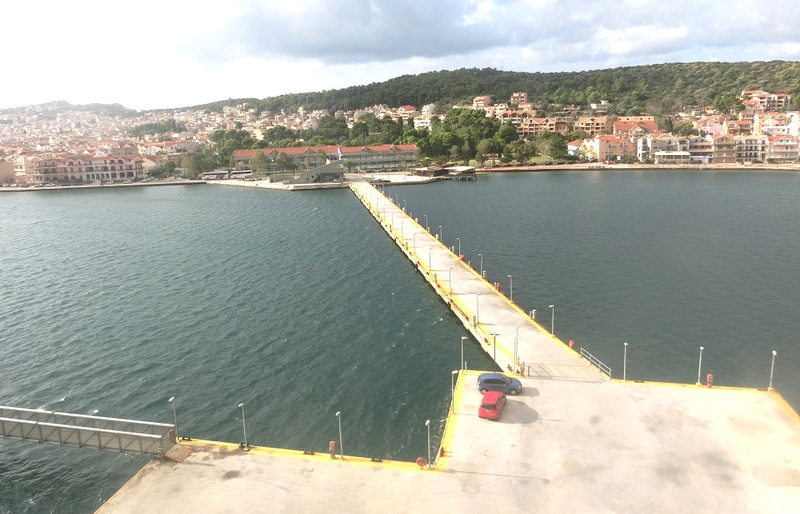 Departing from the pier, you’ll drive toward the eastern shore of Cephalonia, the largest Ionian island. Arriving at the Drogarati Cave, you’ll descend a flight of stairs into a large cavern which is lighted for dramatic effect. Stalactites hang from the ceiling like jagged curtains, and ancient stalagmites reach up from the rocky floor. The colors are predominately red, orange, yellow and white, from the iron content in the rock and the layers of chalk and limestone. 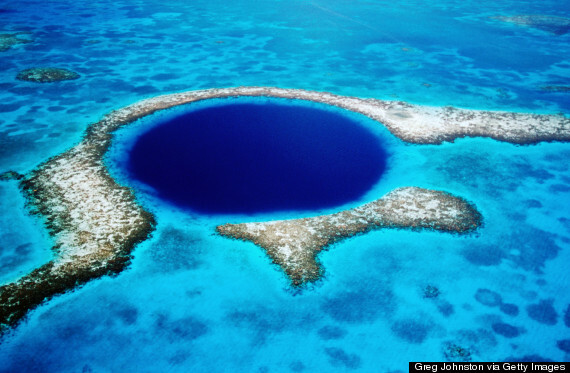 Although estimated to be 100 million years old, the cave wasn’t discovered until about 300 years ago when a violent earthquake opened an entrance. Inside the cave’s Chamber of Exaltation, the acoustics are considered near perfect, and concert events are oftenheld in its voluminous interior. Even the famed opera soprano, Maria Callas, sang here. Continuing on, you will travel in a northerly direction, passing the town of Sami en route to the renowned Melissani Lake. 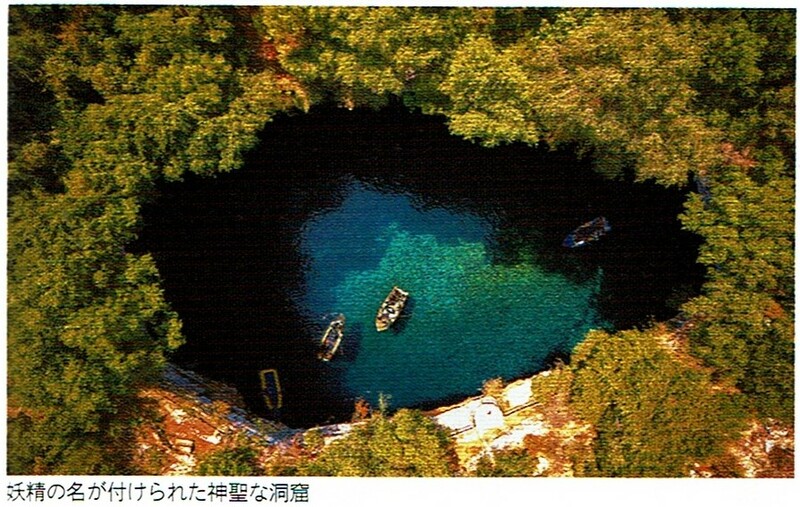 This underground phenomenon looks absolutely magical in the shafts of light that come from 100 feet above, where parts of the ceiling collapsed decades ago. You’ll enter the lake by small boat, paddled in so it hardly disturbs the surface of the water, which is a brackish mix of saltwater from the Ionian Sea and freshwater that originated back in Argostoli and then flowed across the island. The stalactites hanging from the ceiling here are estimated to be at least 20,000 years old. 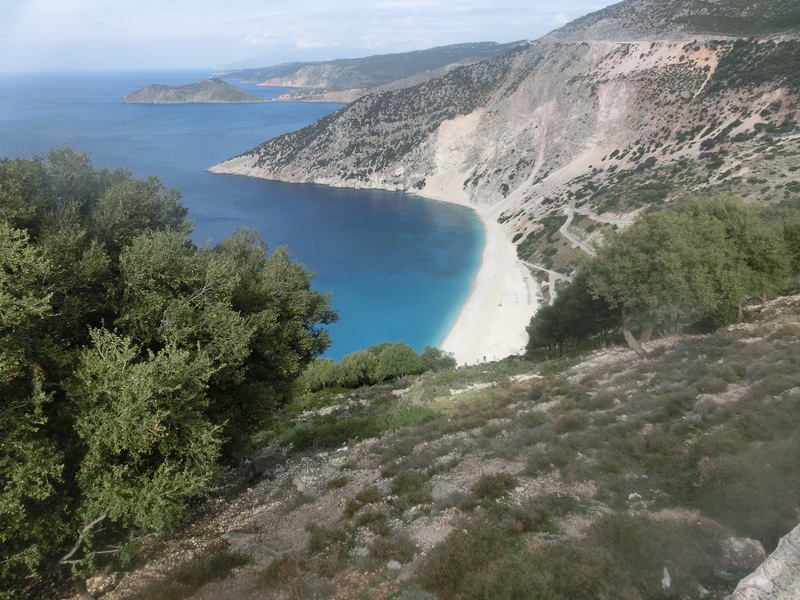 Afterwards, you’ll return to Argostoli via a picturesque coastal route that offers spectacular views across the strait to the island of Ithaca, and further along, Myrtos and its dramatic sheer white cliffs. Please note. 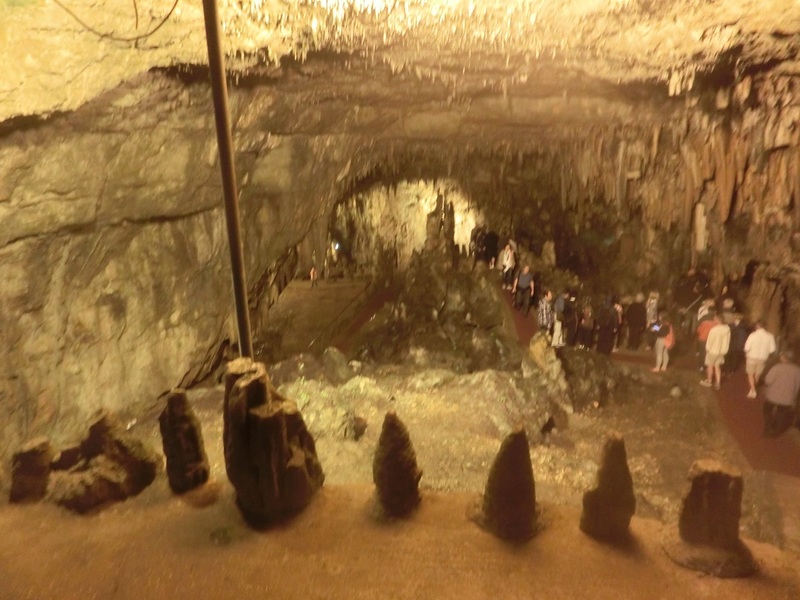 This tour includes approximately l hour of moderate walking; however, surfaces inside the caves are natural, uneven and can be slippery. There is also a flight of steps to negotiate at Drogarati Cave. 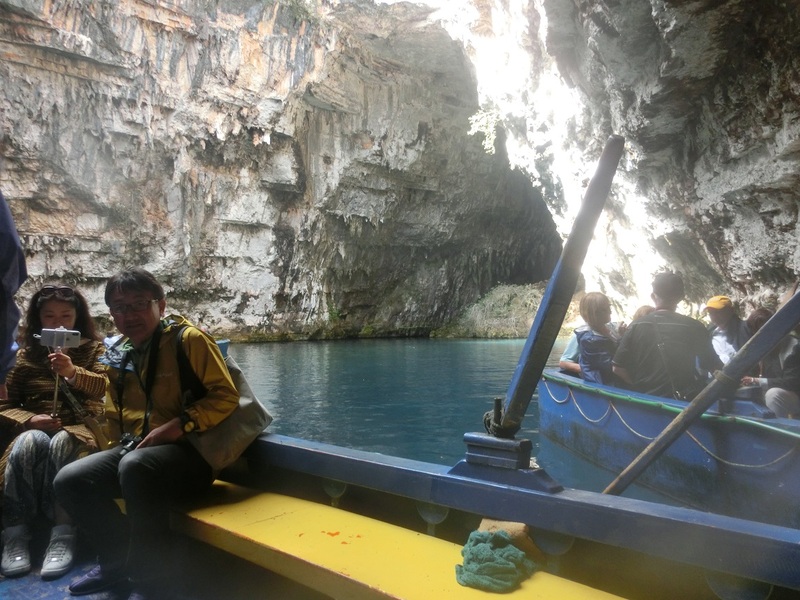 Participants must be able to enter and exit the small boats at Melissani Lake with limited assistance. The tour is not available to wheelchair guests and not considered suitable for those with mobility concerns. Comfortable clothing, hat and flat walking shoes are recommended. No heels please. Temperatures in the caves can be cool so a light sweater or jacket is also suggested. The Ionian Island of Kefalonia, also known as Cephalonia, is strikingly beautiful, with jagged limestone cliffs and terraced slopes dotted with olive groves. The highest point on the island is Mount Ainos, rising to 5,914 feet (1774 meters). Large areas are covered by luxuriant subtropical vegetation, and all around the island, the scenery offers magnificent views of the mountains and the sea. Many sites on Kefalonia reflect its tumultuous history of ever-changing kings and rulers. 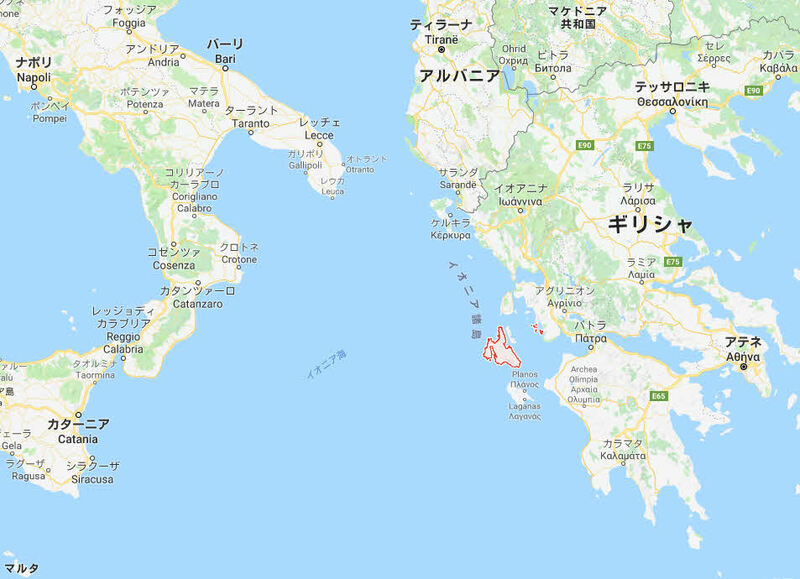 The Norman Kings of Sicily ruled the island during medieval times, followed by Italian overlords who ruled for three centuries under the principality of the Morea. In 1478, the Turks conquered the island only to be defeated 20 years later by the Vegetians. And, for a short time the British ruled here as well. 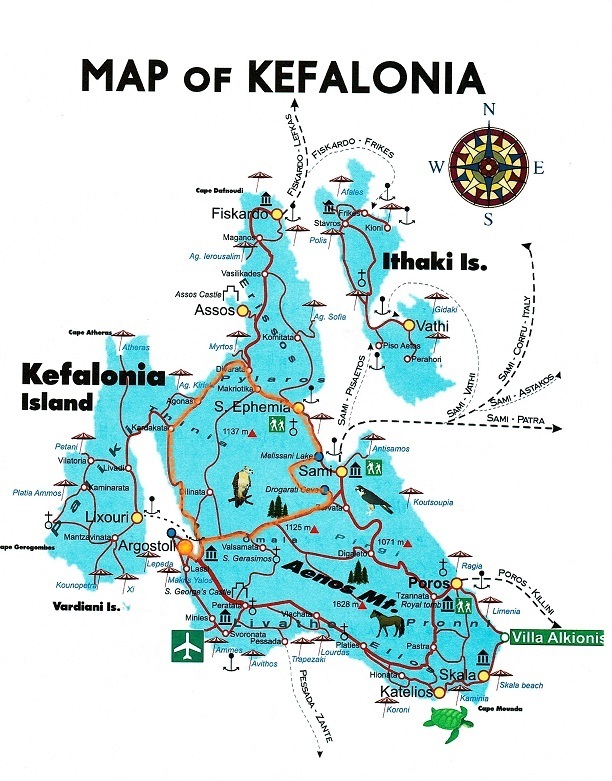 Finally in 1864, Kefalonia was returned to Greece. In 1823 Lord Byron spent several months on the island, captivated by the enduring spirit of the people, the natural beauty of the land and its rich history. Visitors to Kefalonia look to spend time in such places as the serene fishing village of Assos and the scenic town of Argostoli. Other highlights on the island include a Venetian Fortress, a 13th century castle and spectacular caves. The biggest town of the island and the lively capital of the island is Argostoli, a town built amphitheatrically, with intense city life and active, full of various types of entertainments: shops for every taste, coffee to relax, bars and beaches nearby. Although Argostoli was totally ruined by an earthquake in 1953 there are still sites that depict the old Venetian architecture. 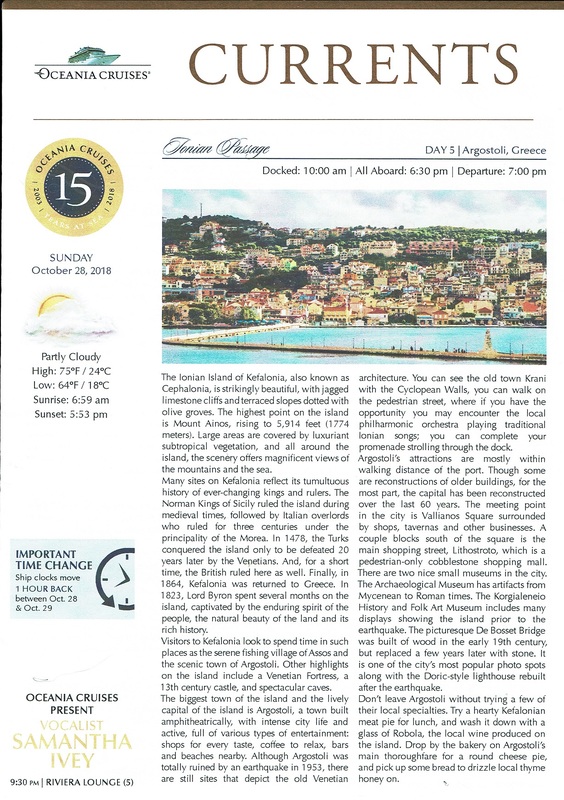 You can see the old town Krani with the Cyclopean Walls, you can walk on the pedestrian street, where if you have the opportunity you may encounter the local philharmonic orchestra playing traditional Ionian songs; you can complete your promenade strolling through the dock. Argostoli’s attractions are mostly within walking distance of the port. Though some are reconstructions of older buildings, for the most part, the capital has been reconstructed over the last 60 years. The meeting point in the city is Vallianos Square surrounded by shops, tavernas and other businesses. A couple blocks south of the square is the main shopping street, Lithostroto. which is a pedestrian-only cobblestone shopping mall. There are two nice small museums in the city. The Archaeological Museum has artifacts from Mycenean to Roman times. The Korgialeneio History and Folk Art Museum includes many displays showing the island prior to the earthquake. The picturesque De Bosset Bridge was built of wood in the early 19th century, but replaced a few years later with stone. It is one of the city’s most popular photo spots along with the Doric-style lighthouse rebuilt after the earthquake. Don’t leave Argostoli without trying a few of their local specialties. Try a hearty Kefalonian meat pie for lunch, and wash it down with a glass of Robola, the local wine produced on the island. Drop by the bakery on Argostoli’s main thoroughfare for a round cheese pie, and pick up some bread to drizzle local thyme honey on.